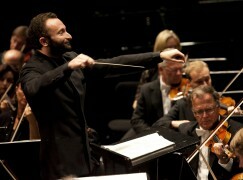 Kirill Petrenko was elected yesterday as chief conductor Designate of the Berlin Philharmonic and Artistic Director of the Berliner Philharmoniker Foundation. He will succeed Simon Rattle in 2018. He confirmed his acceptance to the orchestra last night. Petrenko, 43, will need to withdraw as music director of the Bavarian State Opera (although some German media suggest he might retain both posts for a while). He is the orchestra’s first Russian-born chief, and the first Jewish person to hold that post. Borchard was born on Russian soil but to German parents. And he was never elected by the orchestra but appointed in the days after German capitulation by a Soviet official. So under the bylaws of the Berlin Phil he was not a real chief conductor, but interim and appointed. Absolutely the right decision, on artistic grounds alone. I look forward especially to an amazing talent and a clear understanding of the German repertoire, a quality which has unhappily eluded the present incumbent. And…all the other music in the world? Correct me if I am wrong, but I don’t recall you bringing up Petrenko as the “absolutely right” choice for the position in previous discussion, or did I miss that? Bravo!Sensible choice!Artistic responsibility and conscience won over media hype! Petrenko is a great musician and not the usual marketable ‘star presence’ which is entirely to his credit. “…… the first Jewish person to hold that post.” His ethnic background is irrelevant. Really? Think Budapest Festival Orchestra!!! Great choice! My personal congratulations for Maestro Kirill Petrenko, and for the musicians of the Berliner Philharmoniker! Look forward for your common concerts!! Norman I’m shocked by your assertion that Petrenko is “the first jewish person to hold the post What of the current conductor? Rattle is NOT Jewish, as far as I know. Who cares, both are not the religious type and do not emphasize their grand parents religious affiliations in any way. What it means to be “Jewish” is entirely their private choice. And none of them likes to make it a public issue, so let’s leave it at that. There are fortunately enough people on this planet, who have understood that science has negated religious dogma for many decades already, and that certain ethnic or racial divisions do only exist in people’s imagination, but not in reality. In an interview, Sir S once said that he was born in a ‘Jewish area of Liverpool’ but didn’t actually mention if he was so. Actually, the whole discussion is rather pointless. The business model of the orchestra has to change – which, in retrospect, might have happened already – into a model akin to that of the Wiener Philarmoniker if this move is to succeed. In spite of its long history, the Berlin phil became THE Berlin Phil via its ‘commander and chief’ – Furtwangler, Celibidache as interim, Karajan, Abbado, and Rattle. What does this mean for the world facing the new Berliner? People will have to go for the orchestra, not for the Maestro (which kind of already started happening). In recent years (and this is entirely my opinion) the Soloists and ensembles might have had more interesting moves than the ensemble as a whole (unless you count the whole story of dancing Stravinsky with high school kids revolutionary). We’ll see how this pans out, but in comparison the trend is clear: The orchestra now will have to legitimize the conductor, not the other way around…..and usually it has not worked. Concertgebouw has risen to the top with a very strong Jannsons, LA is following suit with Dudamel in a much larger degree that what they did with Salonen. Its a big risk for an ensemble which has been head and shoulders above the rest for the past 50 years. On a serious note, I only heard Petrenko live once, in a somewhat disappointing Khovanshchina from the Met. Good but not great. But I will definitely give him another try. After all, how could I not? He conducted Elgar 2nd Symphony in his first BPO concert in 2009. Available in Digital Concert Hall. Petrenko is not the first Jewish conductor of the BPO. A certain Joseph Joachim preceded him. First Jewish *chief* conductor, if we want to stick to this pointless discussion. A great choice, and a signal for the future of the orchestra and of classical music: Petrenko is one of the most serious, no-nonsense conductors around, a man dedicated to music, a great colleague and a musician who doesn’t care about personal fame and success, but only cares about the integrity of art. I am happy for him and for BPO. Great comment, Fabio, wholly seconded on my part.